MV Sycamore aviation training vessel is built by Damen Shipyards Group. Image: courtesy of Damen Shipyards Group. The MV Sycamore MATV completed sea trials in April 2017. Image: courtesy of Damen Shipyards Group. The MV Sycamore vessel will be handed over to the Royal Australian Navy in July 2017. Image: courtesy of Damen Shipyards Group. The maximum speed of the MV Sycamore aviation training ship is 23kt. Image: courtesy of Damen Shipyards Group. MV Sycamore was launched in August 2016. Image: courtesy of Damen Shipyards Group. The Royal Australian Navy is expected to receive its new-generation training ship MV Sycamore multi-role aviation training vessel (MATV), built by Damen Shipyards Group, in July 2017. Service entry of the vessel is scheduled for January 2018. As part of the upgraded Helicopter Aircrew Training System (HATS), the vessel will primarily serve as a platform to provide training for the Australian Navy and army pilots involved in naval aviation. The training functions include helicopter deck, take-off and landing operations on the ship’s deck, air traffic control, and helicopter (in-flight) refuelling operations. The vessel can be used for other missions, including navigation training, torpedo and mine recovery, target towing, dive support to mine warfare training, and familiarisation for new crew members. It can also be used for unmanned aerial vehicle support, weapon recovery, and humanitarian relief. Construction on the MV Sycamore MATV began in 2015 and the launching ceremony was held at Damen’s shipyard in Vietnam, in August 2016. Operation and maintenance of the ship will be performed by Serco. In December 2014, Damen contracted Terma to deliver the helicopter mission control system for the training ship. Sea and systems factory acceptance trials of the vessel were completed in April 2017. The ship reached Sydney, Australia, in June 2017, and is expected to be inducted into the Royal Australian Navy in January 2018. The MV Sycamore aviation training vessel’s design is based on the Damen Offshore Patrol Vessel 2400. The MATV features a steel hull with a bulbous bow, and has a length of 94m, moulded beam of 14.4m, and moulded depth of 7m. With a displacement of 2,400t, the MATV can carry 250m³ of fuel oil and 50m³ of fresh water. It can accommodate 22 crew members and up to 71 Australian Defence Force personnel in heated and air-conditioned rooms featuring single, double and four-berth cabins. It is operated from the integrated bridge system located amidships. A flight deck is provided at the stern to operate Australia’s naval combat and military training helicopters such as EC135 T2+. The vessel is also outfitted with hangar, aviation operational spaces, and associated training systems. The onboard aircraft ship integrated secure and traverse system ensures safe take-off and landing from the deck in all weather conditions during the day as well as night. Two rigid-hulled inflatable boats are carried on the aft deck to perform patrol and transportation missions at sea. The ship is also provided with an operating system and antennae to support the operations of a Scan Eagle unmanned aerial vehicle, and an adaptable module for Schiebel Camcopter S100 unmanned helicopter. The MV Sycamore multi-role aviation training vessel can be optionally equipped with a 76mm main gun and up to two 20mm secondary guns. Terma’s SCANTER 6002 combined air and surface surveillance radar is installed in the vessel to detect and track small targets far from the vessel in all weather conditions. It is combined with a 12ft dual-beam, high-gain antenna and a C-Search identification, friend or foe (IFF) system. The aviation control room aboard the vessel incorporates Terma’s C-Flex command and control system, which provides operators with situational awareness, mission-planning, and decision-making capabilities by integrating the weapons and sensors. 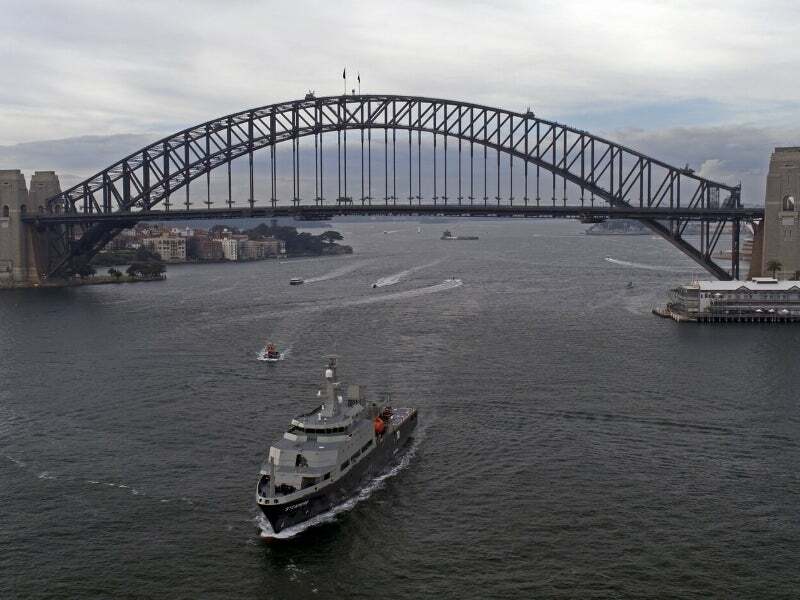 "The vessel will primarily serve as a platform to provide training for the Australian Navy and army pilots involved in naval aviation." An electro-optical fire control sensor is fitted for identification, detection, tracking and engagement of targets. The aviation training vessel boasts a range of navigation and communications systems such as medium-range surveillance radar, ultra-high frequency (UHF) and HF receivers, X and S-band radars, autopilot, and echo sounder. It also includes Navtex, speedlog, gyro compass, differential global positioning system (DGPS), Satcom, and an electronic chart display and information system (ECDIS). The MV Sycamore MATV is powered by four engines rated at 2,350kW each. It is further equipped with two 300mm controllable pitch propellers, and one 450kW, E-motor driven fixed-pitch bow thruster for better manoeuvrability. The vessel’s motion is controlled by an active fin stabilisation system. The helicopter training vessel will operate at a maximum speed of 23kt, will have a range of 6,000nm, and an endurance of 20 days. It has the ability to withstand sea conditions of up to sea state 9 and wind speeds of Beaufort scale 12.